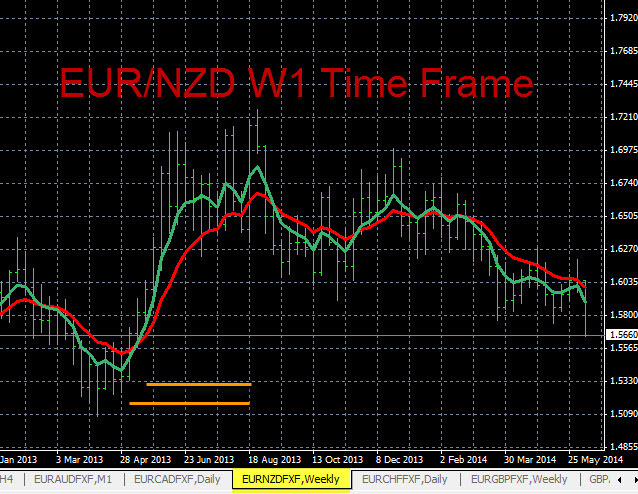 The EUR/NZD is in a strong downtrend on the major time frames like the W1 and MN time frames. When analyzing all of the NZD pairs, the NZD is currently strong on all pairs. Traders can set an audible price alert for a sell at 1.5030, this price is noted on the chart below. The next major support is at the 1.4250 area or lower, also noted on the charts. We also have other sell plans based on NZD strength in our daily trading plans. To perform the analysis of the EUR/NZD we used multiple time frame analysis by individual currency, which is very powerful and revealing. 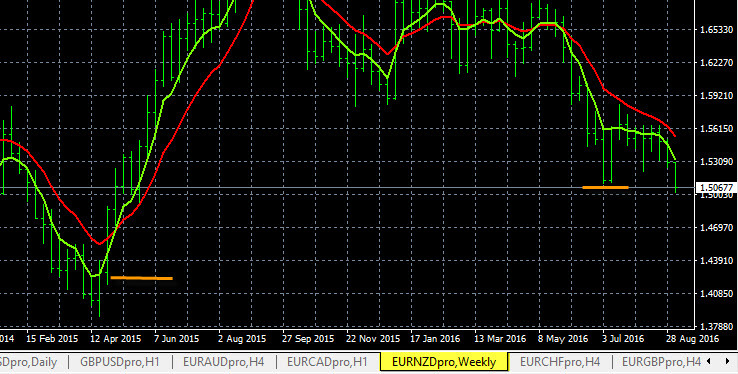 This revealed that the EUR/NZD was in a strong down trend based mostly on the consistent NZD strength in the market. Currently, the EUR pairs are somewhat neutral or choppy. If any EUR weakness comes into the market, perhaps after tomorrow’s EUR news drivers on the economic calendar, we expect a strong sell off on this pair. The Forex Heatmap® and live heatmap alerts will keep us apprised of any EUR weakness in the market in real time. The EUR/NZD analysis shows that this pair is trending down on the larger time frames, like the W1 time frame pictured below. You can set a price alert at 1.6110 for a sell on this pair. When the alert hits, below that price look for a sell signal on The Forex Heatmap®. We see considerable pip potential below the alert price, so the risk and reward ratio would be very good on any sells. This trend analysis was accomplished with multiple time frame analysis by individual currency, using 5/12 exponential moving averages. These moving averages are simple, but powerful when applied across individual currency groups. Today in forex trading the NZD (New Zealand Dollar) strength signals were evident on all pairs on The Forex Heatmap®. The EUR/NZD sold off and the D1 trend is pointing down on this pair, we will look to hold on to this trade, it should drop for at least one more day down to the next support which is estimated at 1.6900. The NZD/CHF also rose, the D1 time frame is pointing up on this pair, the next resistance area is at around 0.6400, we would scale out lots as it approaches this price level. The trade signals you see below are live signals from The Forex Heatmap®, which provides easy to understand trading signals for 28 pairs. Today in forex trading, our alert system, The Forex Heatmap®, pointed traders to the NZD (New Zealand Dollar) strength in the market. There was also a lot of EUR (Euro) weakness in the main trading session. The EUR/NZD sold off and is at the 1.4250 support area. This is a strong support area but all of the major trends are pointing down on this pair. If this pair breaks 1.4250 there is no historical support below there, and substantial additional pip potential. The NZD/CAD also rose, this pair is ranging so we would scale out lots and manage any profitable buy entries. The alert system you see below is The Forex Heatmap®, which supplies visual trading alerts for 28 pairs. Today in forex trading the EUR/NZD had a buy signal on The Forex Heatmap®. You can see on the heatmap image below that the New Zealand Dollar (NZD) was weak on all pairs. This NZD weakness drove good short term movement on several pairs. The EUR/NZD rose, and this pair could continue higher for a day or two but we would manage money or take some profit and scale out lots, as the long term downtrend will resume at some point on this pair, likely in a couple of days. Similarly, the NZD/CHF dropped against the the major trend on this pair. We also expect the NZD/CHF to reverse back up in a day or two. The forex trade signals you see below are from The Forex Heatmap®, which provides real time signals and visual alerts for 28 currency pairs. Today in currency trading the EUR (Euro) weakness was evident on all pairs. All of the EUR pairs dropped. There was also some NZD (New Zealand Dollar) and CAD (Canadian Dollar) strength in the market as well. This caused the EUR/CAD and EUR/NZD pairs to drop strong to the downside. The EUR/NZD should continue lower in the current strong downtrend, there is no historical support below the current price. The EUR/CAD has broken one support level and could continue much lower on the higher time frames. The live currency strength indicator you see below is The Forex Heatmap®, which provides live buy and sell signals for 28 pairs, including seven EUR pairs. 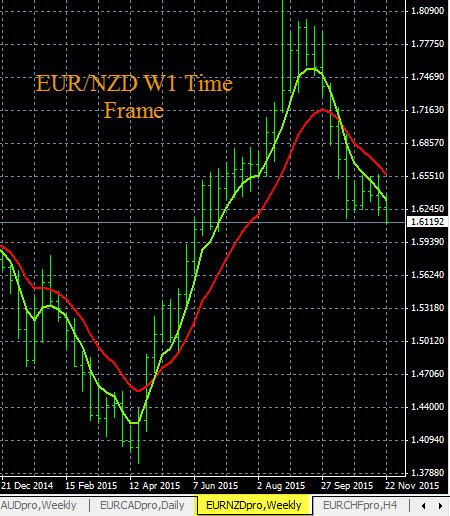 The EUR/NZD is trending down on the larger time frames, like the W1 time frame shown below. The analysis shows the next major support area begins around 1.5300 or slightly below there. The current pricing is around 1.5660, so this pair has excellent pip potential for a sell. Look for a sell signal on this pair in either trading session using The Forex Heatmap®. The New Zealand Dollar (NZD) is strong across the board now after the NZD interest rate announcement today, and this should drive the NZD strength and the EUR/NZD lower. This analysis was done using the free forex trend indicators we provide to our clients and multiple time frames.